August soybeans closed at $11.84 ½, up 14 cents, November soybeans closed at $10.38 ½, up 7 cents. Yesterday's export sales of almost 3 MMT were impressive, in fact the second highest on record. Weather conditions remain conducive to producing a very good 2009/10 crop, but it is going to be a little bit late, and until we get there we are going to have a very tight old crop supply situation. The average trade estimates ahead of Wednesday’s USDA crop production report for 2009 soybean production and yield are 3.219 billion bushels and 42.13 bushels per acre. September corn finished at $3.22, down 10 ½ cents, and December corn finished at $3.26 ½, down 13 ¾ cents. Weather forecasts for this weekend and next week over much of the Corn Belt call for hotter temperatures, scattered showers and then turning drier with normal to above-normal temperatures which will hasten crop development. The average trade estimates ahead of Wednesday’s USDA crop production report for 2009 corn acreage, production and yield are 86.333 million acres, 12.49 billion bushels and 157.295 bushels per acre. September wheat settled at $4.89 ½, down 10 ¾ cents. Weather forecasts over much of the Plains seen conducive to remaining winter wheat harvest, and developing spring wheat crops, which added pressure to futures. A sharply higher US dollar index gave additional pressure. The average trade estimates ahead of Wednesday’s USDA crop production report for 2009 all wheat and winter wheat production are 2.151 billion bushels and 1.5315 Bbu. EU wheat futures closed mixed, with London down but off session lows in a quiet end to the week Friday. Paris November milling wheat closed up EUR0.50 at EUR130.50/tonne, and London November feed wheat closed down GBP0.25 at GBP98.25/tonne. Wet weather is delaying the UK harvest, with the domestic winter barley crop around 60% cut, according to ADAS, well behind the 6 year average of 90% harvested at this stage. It is still very early days for winter wheat, although harvesting in East Anglia appears to be turning out some decent yields and proteins, according to some reports. The weather at home seems to have dried up since I returned to these shores, maybe I brought it back with me? Around 60% of the OSR crop has also been cut according to ADAS. Yields are generally better than originally anticipated across western Europe, with the association of German farm cooperatives (DRV), now estimating the 2009 German wheat crop at 26.6 MMT. London white sugar futures surged to a fresh all-time high Friday morning, with front month October hitting USD528.50/tonne, USD9.60 up on last night's close. Monsoon rains continue to elude northern India, where much of the country's sugar cane is grown, whilst the Brazilian crop is being dogged by too much rain. Increased demand from Mexico, who has also had weather problems with it's own crop, is seen further increasing the global sugar deficit this year. India's monsoon rains were the lowest in over eighty years in June, although near normal rains in most areas in July gave rise to hopes that the worst was over. However, in the week to August 5th rains were 64% below normal, according to official weather data. Inadequate rains are forecast for the week ahead too, in a country where 60% of the land under cultivation relies entirely on natural rainfall. A high ranking GASC official, and another employee of the state-owned wheat buyer were arrested, and subsequently released on bail this week, as part of the ongoing investigation into the import of Russian wheat into Egypt. The public prosecutor apparently also ordered the arrest of Ashraf El Attal, chairman of the trading company Egyptian Traders Co. Attal was of course the head honcho at GAFTA, although he apparently resigned from this post late last month amidst a fanfare of understated non-publicity. Egyptian Traders Co are said to be under investigation from the Egyptian prosecutor's office and embroiled in a complicated GAFTA-arbitration case with the original Russian exporter of the wheat, Rosinteragroservis (RIAS). The GASC employees arrested include the chief administrator of imports and contracts. September soybeans closed down 4 1/2 cents at $11.70 1/2 a bushel, and November soybeans finished 15 cents easier at $10.30. The dollar was firmer and crude oil weaker, which created a negative tone, but the fall could probably be largely attributed to a correction from recent gains. Export sales were strong yet again, with the USDA saying almost three million tonnes of US beans were sold last week. weather forecasts are a little mixed for August, as is the interpretation of whether a bit of heat will be stressful or beneficial. September corn ended down 14 1/2 cents at $3.32 1/2 per bushel and December corn ended down 16 3/4 cents at $3.40 1/4. As with soybeans, today's price action may largely be a partial reversal of some of the recent gains. Weekly export sales were above the high end of trade guesses at 1.152 MMT. There seems to be some debate whether the anticipated warm-up next week will be harmful or helpful for corn development. The USDA are to announce a revised acreage estimate for US corn plantings next week, which is also keeping the market nervous. September wheat closed down 28 1/2 cents at $5.00 1/4 a bushel. Egypt bought mostly French wheat, and a little Russian, in a tender which was obviously seen as bearish for US wheat. Export sales were 552,800 MT and above the high end of trade guesses of 500,000 MT, which at least indicates that exports are picking up a little. The last few week's export totals have all been above or towards the upper end of trade estimates. A firmer dollar and increased harvest activity in the northern hemisphere were the overriding bearish influences today. EU wheat futures closed sharply lower Thursday, with London wheat crashing into double figures for the first time this year as harvesting advances across Europe. Paris November milling wheat futures closed down EUR4.00 at EUR130.00/tonne, and London November feed wheat ended down GBP3.00 at GBP98.50/tonne. The magnitude of the drop of London wheat was maybe a tad surprising given that the pound fell out of bed after the BoE announced more QE measures. The BoE appear to be giving out some mixed signals, and not really maintaining an air of confidence that they genuinely know what they are doing. 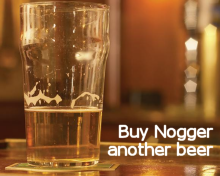 Last month QE was on hold and this month it's back on. Hardly inspiring. EU weather has improved somewhat this week, allowing for further harvest advancement, and yields are generally a little better than expected in many places, according to reports. US markets were also under pressure all day, which added to the negative tone for Europe, even though Egypt heavily favoured French wheat in a tender today. State-owned GASC booked 210,000 MT of wheat in a tender today with 180,000 MT of it French wheat and only 30,000 MT Russian wheat, despite the Black Sea origin being around $3/tonne cheaper. November soybeans ended up 13 1/2 cents at $10.45 a bushel. Weather conditions are good for continued crop development. Export sales are estimated at a whopping 2.2 to 2.5 MMT for tomorrow with China being in the market this past week for a known 1.8 MMT of soybeans. The recent Chinese soybean auctions have not gone well, less than 5,000 MT has been booked out of offers of 1.5 MMT the past three weeks. Informa estimates the US soybean yield at 41.6 bushels/acre. That figure is a little lower than F C Stone's 42.4 bushels/acre and Doane's 42 bu/acre. September corn ended down 7 1/2 cents to $3.47, and December corn ended down 8 3/4 cents to $3.57. Informa was out today stating their impression that the USDA will have a yield estimate of 157.1 bushels of corn to the acre. F C Stone are using a corn yield of 160 bushels/acre, whilst Doane come in significantly lower at 155.6 bu/acre. September wheat closed down 13 1/2 cents at $5.28 3/4 a bushel. Trade estimates for export sales to be released tomorrow are between 350,000 to 550,000 MT. The French grain analyst Agritel expects France’s soft wheat crop to rise to more than 38 MMT, adding to existing stocks. EU wheat futures resumed their downwards trend Wednesday after a few days of brief respite. November Paris milling wheat ended down EUR3.00 at EUR134.00.tonne, and London November feed wheat closed down GBP2.50 at GBP101.50/tonne. A weak dollar contributed towards losses on EU wheat, with the pound close to a 11-month high set yesterday. Egypt is tendering to buy wheat again tomorrow, which may provide some support if they go for French wheat, as has been the pattern recently. US futures also fell after posting strong gains Tuesday, which added to the bearish tone. Recent rains in Argentina appear to have arrested the startling decline in wheat production there, although that is still expected to come in at the lowest in a hundred years. 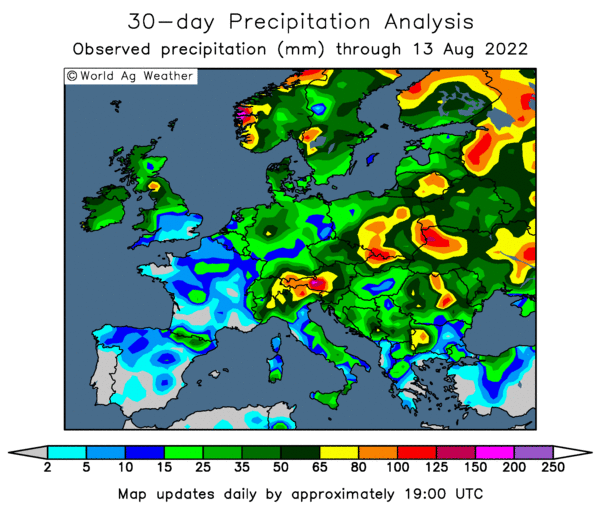 Patchy rains across much of northern Europe are hampering harvest activity, although no major yield losses are anticipated there could be quality implications. It's another torrid day of unbroken sunshine and temperatures well into the 90's here on the sunny Costa del Sol. Have thus far managed to resist the temptation to pop into Puerto Banus to try a bit of Jordan spotting. Talking of resisting things, I see that the Chinese government continue to fail to be knocked over in the rush of takers at their weekly soybean auctions. Since they begain offering beans at the equivalent of $15/bushel three weeks agao they picked up zero interest in week one, zilch in week two and have today managed to offload a mightly 4,335 MT in this week's auction. The cynics that said the announcement of the sales was merely an attempt to drive the market lower to buy some more US beans appear to have been vindicated. August beans crashed below $10/bushel when the news was announced, and are now knocking on $12/bushel. Meanwhile China has been an ever present in the USDA's weekly export sales reports, and look certain to feature heavily again tomorrow. A quick glance at the charts on the widget for US soybeans, corn and wheat throws up a stark contrast. Beans have rallied sharply in the last three weeks, whilst corn and wheat have barely moved. I wouldn't normally glance at what the sugar market is doing, but with prices hitting all-time highs on a daily basis it's grabbing my attention. London white sugar closed at $512.50 last night, the highest since trading began. This morning it's popped up to $514.60 so far. I might pick up a few more sachets than normal at the airport tomorrow. It's a pity there isn't a futures market in KFC wet-wipes, I'd clean up! ADM reported a drop of 83% in Q4 earnings yesterday. Corn processing reported a $11m operating loss, quite a turnaround from a $262m profit the year before. The recent EUR10 million reduction in their fine for their part in a citric acid price-fixing cartel should come in handy then! September corn closed down 3 1/2 cents at $3.54 1/2 per bushel, and December corn ended down 3 1/4 cents at $3.65 3/4. Above normal temperatures are forecast to dominate the Midwest and Eastern Corn Belt from August 9 to the 17th giving needed growing degree days to the corn crop. This should be favourable for crop development. Private exporters reported to the USDA the sale of 118,000 MT of corn to South Korea for the 2009/10 marketing year. September soybeans closed down 5 cents at $10.83 1/2 a bushel, and November soybeans ended up 1 cent at $10.31 1/2. Yesterday’s crop progress report listed 76% of the soybean crop in the bloom stage which is the same as last year but behind the 5 year average by 10%. Soybean pod setting is at 36% as of August 2nd, at the same rate as last year but 18% behind the 5 year average. Wheat ended down 7 cents at $5.42 1/4 a bushel. Spring wheat is 98% headed as of August 2nd. Spring wheat is 3% harvested compared to 5% last year and 15% for the five year average. The spring wheat crop is rated 6% poor to very poor and 71% good to excellent. This compares to last weeks 7% poor to very poor and 74% good to excellent. Winter wheat is 85% harvested, in line with last year. EU wheat futures closed lower Tuesday in a corrective move from recent gains. Paris November milling wheat closed down EUR1.00, at EUR137.00/tonne, and London November feed wheat traded down GBP0.25 at GBP104.00/tonne. A lower close was not entirely unlexpected after futures rebounded somewhat from the last few sessions. The dollar was aharply lower, with sterling particularly steady after promising figures from Barclays and HSBC boosted the pound. The pound bobbed above $1.70 for the first time since October on a wave of enthusiasm for risk. 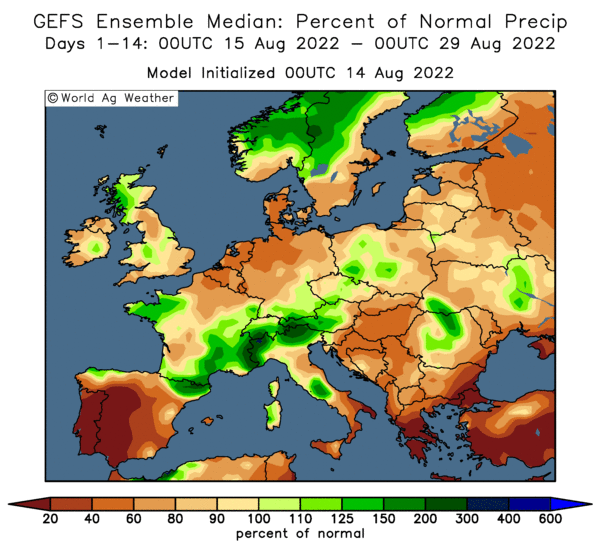 Although the EU wheat harvest continues to be dogged by bad weather ideas are that yields will be fine even if quality is damaged. In the US things are pretty similar, spring wheat harvesting is well behind schedule and crops are largely looking great, although proteins are expected to be below normal. White sugar futures in London hit an all-time high of $505.90/tonne yesterday as spec money found a new gravy train. Unlike the grains sector global demand for sugar is outstripping supply, by an estimated 6-9 MMT this year. Planting of sugarcane in India is down 10-15% as monsoon rains have eluded top-producing states in the north of the country. Uttar Pradesh, the nation’s second-largest sugar producer, has declared drought in 47 districts. There are potential implications for the grain markets here too if spec money suddenly rekindles it's interest in commodities as a chance to make some easy money. Planting of winter wheat in India, the world's second largest producer and consumer, isn't too far away either. The same states that are suffering drought now are also India's top-producing wheat regions. Winter wheat here is heavily reliant on irrigation from resevoirs normally overflowing with abundant monsoon rains. The largest wheat producing state in India? Uttar Pradesh. Oh no, I'm starting to get bullish again. Nurse! Private crop forecasts are starting to emerge ahead of next week's USDA production numbers due on Aug 12. The USDA will also issue a revised corn planted acreage estimate then too, but not one for soybeans. crop at 3.247 billion bu. Another private firm, Doane Advisory Services, yesterday pegged the corn crop at 12.312 billion bushels and soybean production at 3.225 billion. That compares to last month's figures from the USDA of 12.29 billion for corn and 3.26 billion for beans. F C Stone are now using a corn yield of 160 bushels/acre, whilst Doane come in significantly lower at 155.6 bu/acre. F C Stone have the average soybean yield at 42.4 bushels/acre and Doane 42 bu/acre. The USDA last month was using a corn yield of 153.4 bu/acre and a soy yield of 42.6 bu/acre. It is interesting to see that both private estimates are lower for soybeans and higher for corn than July's USDA numbers, yet the trade is anticipating a reduction in corn plantings by half a million acres. A reduction in corn acres also would imply an increase in soybean area, although the USDA, in their infinite wisdom, won't be issuing a revised planting figure for beans. Widely quoted pundit, Darrell Good of the University of Illinois, last month said that corn yields could come in over 160 bu/acre, and beans close to 45 bu/acre given favourable August weather. Is the forecast "heat up" next week a threat, as some of the newswires are saying? Well, the crops don't seem to be lacking moisture and some heat would probably speed up development a little I'd say, helping things catch up with the five year average. Last night's crop conditions report didn't appear to show development for corn and beans as far behind schedule as I'd have thought. I wouldn't expect a warm-up to cause too much stress at all, indeed it could be beneficial, and take away some of the early frost worries too. After the close of pit trading, the USDA reported good to excellent weekly crop condition ratings for soybeans at 67 percentage points. This was unchanged from last week and was higher than trade expectations, as a slight decline had been anticipated. 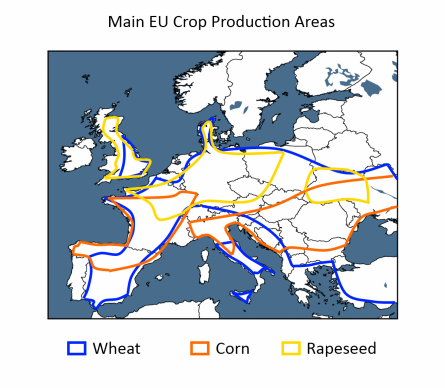 Crop advancement is probably more important than anything else at the moment. The USDA said that 76% of the crop was in the blooming stage, up from 63% last week but down from the average of 86%. They added that 36% of the crop was setting pods, up from 20% last week but down from the average of 54%. The USDA reported good to excellent weekly crop condition ratings for corn at 68 percentage points. This was 2 percentage points lower than last week and fell within trade expectations. They said 76% of the crop was silking well below the five-year average of 89%. They said 76% of the crop was silking, up from 55% the previous week but down from the five-year average of 89%. They also said that 14% of the crop was in the dough stage compared to the five-year average of 29%. The USDA reported good to excellent weekly crop condition ratings for spring wheat at 71 percentage points, which was 3 points down on last week and the lowest so far this season. Winter wheat harvested was 85% completed, which is 5% lower than the 5-year average. August soybeans ended 39 1/2 cents higher at $11.73 1/2 a bushel, and November up 48 1/2 cents higher at $10.30 1/2. Continuing tightening of old crop supply due to strong export demand lends supportive tone to the soy complex. Sharply higher crude oil futures and a sharply lower US dollar index provides bullish outside market support. Good crop weather forecasted this week over much of the Midwest gives pressure to futures. September corn ended up 18 1/2 cents to $3.58 per bushel, and December corn ended up 19 1/2 cents to $3.69. harply higher crude oil futures and a sharply lower US dollar index lends outside market bullish support to futures. Continuing good crop weather forecasted this week over much of the Corn Belt weighs on futures, limiting some gains. Weekly export inspections for corn came in at 47.336 million bushels, which fell above trade estimates. September wheat closed up 21 cents at $5.49 1/4, sharply lower US dollar index and spillover rally in corn and the soy complex lend support to futures. Weekly export inspections for wheat came in at 13.548 million bushels, which fell within trade estimates. November Paris milling wheat ended up EUR2.5 at EUR138.00/tonne, and London November feed wheat closed up GBP1.25 at GBP104.25/tonne. It wasn't pretty but futures followed America higher. A sharply higher US market, although that was largely led by a weaker dollar, dragged EU prices higher from the off. 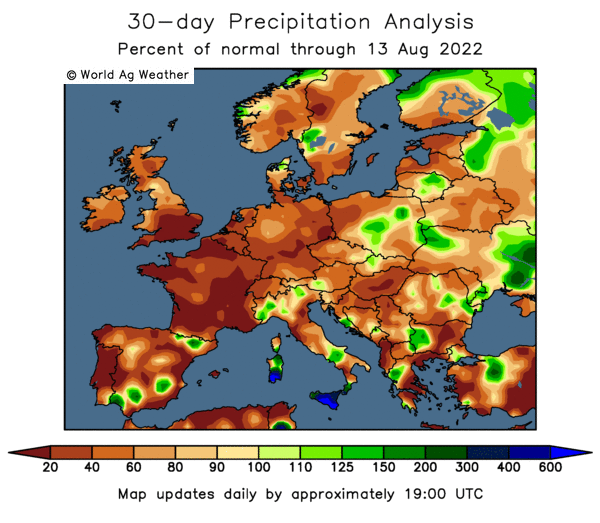 US weather conditions seem largely ideal for promising crop development, bur wet weather in the EU is dragging crop development behind, particulatly for milling varieties and hampering harvestring efforts. French wheat got a significant look-in last week when Egypt bought a quarter of a million tonnes, overlooking Russian wheat at the same time. That's three out of the last four Egyptian tenders that have seen French wheat get booked, when previously it was all Russian business. Hardly a day seems to go by without cows getting more bad press. The latest reported incident involves a farmer in Gartly, Aberdeenshire being seriously hurt after a calf he was ear-tagging cried out in pain to it's mother. The enraged cow then charged the father of four, butting his face and chest before trampling on him as he lay helpless on the ground. If a friend who was also at the scene hadn't intervened then the 74-year old farmer would have been trampled to death, according to the report. Seems a tad ironic does it not, that cows are so protective over their offspring whilst the delightfully pretty Theresa Winters (warning babe alert here) has quite cheerfully given up her last 13 kids without hardly a wimper? The pound has broken through the £1.68 mark against the US dollar this morning, posting it's highest levels since October 20th 2008, as the dollar's safe haven status loses it's appeal. The pound has been stuck in a sideways pattern around the mid to low $1.60's since the beginning of June. Could a break out of this range mean a move higher? It seems a tad surprising that the pound seems to be outperforming today, given that the BoE are due to meet again this week and may well announce another round of QE. A Morgan Stanley research note, quoted on Reuters, recommends investors buy Gilts ahead of the MPC decision on Thursday. They believe that the next (and hopefully final) round of QE is already priced into the market. This week could be a big week, with assorted important US economic data and earnings from various leading companies in the EU and Far East, kicked off by a $3 billion first half profit from Barclays this morning. HSBC, Europe’s largest bank, also posted an unexpected $3.35 billion full-year profit when a loss had been expected. Fed Chairman Alan Greenspan was apparently quite bullish in a televised interview on ABC over the weekend, saying that he now expects better economic growth than most analysts are predicting. Additionally, he foresees a commodity bull run extending into 2010. What are the implications of a stronger sterling and weaker dollar for say UK wheat? Good question, the initial reaction would have to be that this particular scenario is bearish for such sterling-priced commodities. A quick check back in recent history however would appear to suggest that a generally bullish commodities bmarket has a lot more to do with UK wheat prices than cable. The contract high for the current London November wheat future of £158/tonne was set in June 2008, the front month all time high of £192.20/tonne (hands up all who sold at that) was set at the beginning of Feb 2008. In both cases the exchange rate was well over $1.90 against the greenback. Morning all, the mercury has already pushed above 80 this morning here, with daytime temperatures regularly hitting 95-96 in the shade this past week. That's a largely alien scenario to the American Midwest this summer which was seen unseasonably cool conditions, with several states reporting their coldest July on record. That leaves US crops well behind schedule in terms of development. As I asked on here a few weeks ago: how non-threatening really is non-threatening weather. According to a report released Friday by the US CPC (Climate Prediction Centre) August will continue to be be colder than normal for the Central and Eastern Corn Belt. Precipitation during the same period will be above normal, they say. Meanwhile contrary to some educated sources, China keep coming back to buy US beans with a vengance, corn export sales are holding well above a million most weeks and even wheat sales have now started to pick up. I've read many times that a cool US summer is not necessarily a precursor for an early frost, but the market doesn't seem to fancy betting on that at the moment. Several reports are suggesting that the CPC have got it wrong and that August will see much warmer temperatures return to the Midwest a week from now. With beans thirty up on the overnights it looks like the market is concentrating on more immediate factors like tonight's USDA crop progress report. Other outside factors seem to be coming into play too. Crude is up, the dollar is down, a little bit of risk appetite is back in vogue, Barclays announce £3bn in profits for the first six months of 2009. It's 95 in the shade here on the aptly named Costa del Sol. Managing to do a little bit of work every day in between cold beers and regular dips in the pool to keep my Brad Pitt-like six pack nicely chilled. Hear that you've been having a bit of rain back in Blighty! What happened to that BBQ summer the weathermen promised us? This must be bringing back uncomfortable deja-vu like memories for a few farmers, particularly in the north. Checking out the old radar maps it looks like the harvest will have been a stop start affair in France & Germany too. Have fun & normal blogging service will be resumed a week on Mon 10th.